Set a table that celebrates the bounty of Monticello’s terraced garden—or your own. 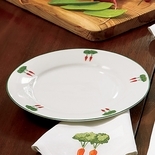 Carrots, beets, hot peppers and Jefferson’s favorite English peas form the colorful borders of the porcelain dinner plate and hemstitched cotton place mats. Specific vegetables are showcased on each salad plate and cotton/linen napkin. Exclusive to Monticello, these plates and linens are based on a tapestry design by famed textile artist Laura Foster Nicholson. Nicholson created 68, 6" square tapestry panels inspired by the gardens at Monticello. “Like a giant, patterned textile just unfurled from the loom,” she wrote about the garden’s 1,000-foot, ribbon-like design. Dishwasher-safe plates and imported machine-washable linens. Dinner plates are 10” diameter and sold individually.